Welcome to the Sunday Surf! So, this is what I get for organizing my life so haphazardly. I tend to keep one bazillion windows open in my browser to remind me to get back to them — whether to leave a comment, join a group, Tweet or otherwise promote, fulfill a deadline, or … put the article into my Sunday Surf. What happens after awhile is my browser gets cranky. Really, really cranky. And then it crashes. For quite awhile, I can recover the windows. But at some point, it says, Enough is enough, and crashes again before I can. And that is what has happened. So I am trying to piece together what I intended to put in here by scrolling through my browser history. Incidentally, it's astonishing how much utter crap I Google. Also, how terribly behind I am in commenting. But I digress. Here are some of the best links I've read this past week (or so). This week is "World Breastfeeding Week 2010"! Woo-hoo! The theme this year is "Just 10 Steps! The Baby-Friendly Way." The idea is to encourage hospitals and other facilities offering maternal and infant health care to become baby- and breastfeeding-friendly by taking these crucial ten steps to support breastfeeding success. "Call for Submissions: Gentle Parenting Successes and Suggestions" from Code Name: Mama: If you like the above sort of thing, here's your opportunity to submit questions and ideas for gentle parenting. "Birth of Impressionism (The Art of Un-Kid-Friendly)" from Keeps Me Smiling: How to take children to an adult-centered exhibit and have a good time. "But that's OK, I do this for a living. I take kids out and about, and darn if I'm not going to have a good time doing it. So we used the time in line to chat about art, and the difference between realism and impressionism, and about how Noelle needed to go potty and that she is in fact a better artist than any of these people in frames." "With the new ACOG guidelines, most women who have had a cesarean are now encouraged to consider trying vaginal birth." "Toddler Wearing or 'Why, Yes, I Do Still Wear Him!'" 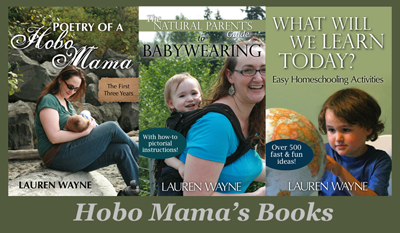 from Becoming Mamas: Yea for babywearing toddlers! "Kids in the Kitchen: Snack Central" from Be Present Mama: Dionna suggested this to me in the comments of my article on letting children cook for themselves, and it's full of tips for helping children take ownership of healthy snacking habits. In the elsewhere-but-still-me category: "Creating your comment moderation policy" from LaurenWayne.com: What sort of atmosphere are you fostering in your blog's comments? A Libre Tea Glass that allows you to enjoy loose-leaf tea on the go — whether hot or iced! My newest compilation is a list of "Giveaway linkies by day" so you can link up your giveaways to promote them at various giveaway blogs. Linkies and other contest listing sites are a good way to get the word out about any contest you're running. I also have a "Wordless Wednesday linkies" list if you play along with that meme and want to find ways to get more exposure for your weekly photo post. If you have a linky you want me to add to either, let me know. "I understand the need for conformity. Without a concise set of rules to follow we would probably all have to resort to common sense." The rest of the site is hilarious, too, if the above warning didn't scare you off. 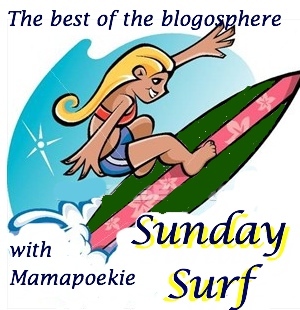 Check out Authentic Parenting, Baby Dust Diaries, Maman A Droit, and Navelgazing for more Sunday Surfing! I am so the same! I tend to have two firefox browser windows open, one for things I'm doing and one for things I need to come back to. The things I need to come back to can stay there forever sometimes! Thank you for the shout out! I'm excited to see what we get in the gentle parenting series. i just found your blog and spent all weekend reading it! i am a new mom and have gravitated towards natural parenting as well. i love it! Ha! Glad you liked that site. I laughed until I nearly cried. And that Jane Austen clip is hilarious. Loved the article about babywearing toddlers as well (my youngest is nearly two and still loves to be in the Ergo).